Rose cut diamond riviere necklace with a diamond set crowned heart pendant: Description by Adin Antique Jewelry. With every piece handcrafted in silver and an 18K yellow gold underlay, 50 rose cut diamonds set on foil lustre from this 17th century rivière necklace as an aura of light destined to disclose a Flemish heart pendant. By virtue of a bow full of rose cut diamonds, its suspending diamond wreath with a dainty diamond heart emanates a timeless flair. Even the closure of this Georgian jewel is embellished with table rose cut diamonds and so it evidently is an adoration of the finest women of our era. 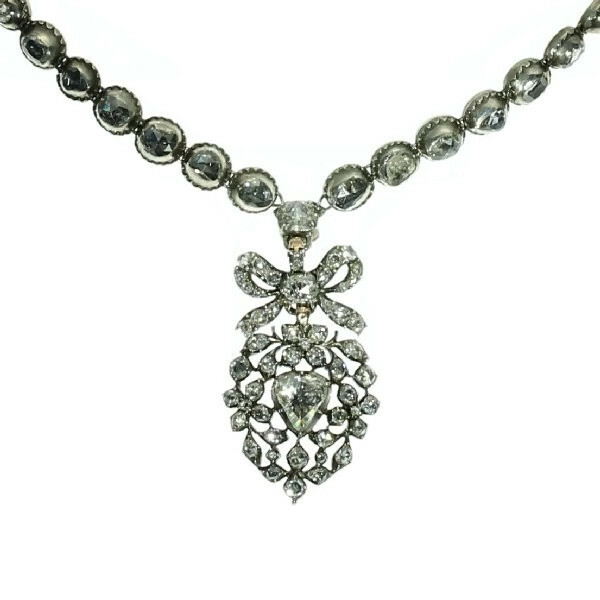 The rivière (a rivière is a necklace made of a line of stone-set links) consists of diamond settings that are typical for the second half of the 17th Century (ca. 1675) while the pendant is more a product of the first quarter of the 19th century (ca. 1820). The closure could be older than the rivière as it is set with table cut rose cut diamonds, which indicates that it is made somewhere between 1550 and 1650. The gold backing of the silver necklace seems to have been retouched and it is our guesstimation that the three different jewels have been re-designed to this jewel by a skilled goldsmith somewhere in the last 50 years. Extra information: Some of the rose cut diamonds are cut so called table rose cut diamonds. When a rose cut diamond is cut in a way that the top part is parallel to the backside of the stone, we are talking about a table rose cut diamond, a way of diamond polishing typical for the 15th till 18th Century. The heart pendant could be a so called Flemish Heart. The distinct devotion of the Flemish people for Madonna, well-spread especially in Antwerp, Belgium in the 18th and beginning of the 19th Century, seems to be the cause of the so-called Flemish Heart(or in Dutch: 'Vlaams Hart'). Given on Mothers day, it represents the crowned heart of Maria in a rosary. The 'wreath' of roses has in its center a loose hanging pendant set with the nicest biggest diamond of them all as 'the heart of Maria herself'. However, because this particular example has eleven stones surrounding the central stone and lacks the customary crown or love trophy surmounting the heart, which makes us hesitant to classify it as a Flemish heart. The custom of giving a Flemish Heart on mothers day has been vanished ever since. In Antwerp mothers day is celebrated at August 15th, the Maria celebration par excellence: Maria-Ascension-Day. Everywhere else in the world mothers day is celebrated on the second Sunday in May. The initiative of the American President Wilson in 1914 to proclaim the second Sunday in May to be mothers day was soon followed by the rest of the world. Diamonds: Eleven table cut rose cut diamonds in the closure. 50 rose cut diamonds in the rivière. One big and 54 smaller rose cut diamonds . We do not have the weight of all these diamonds which is normal in our trade when it comes to rose cuts.